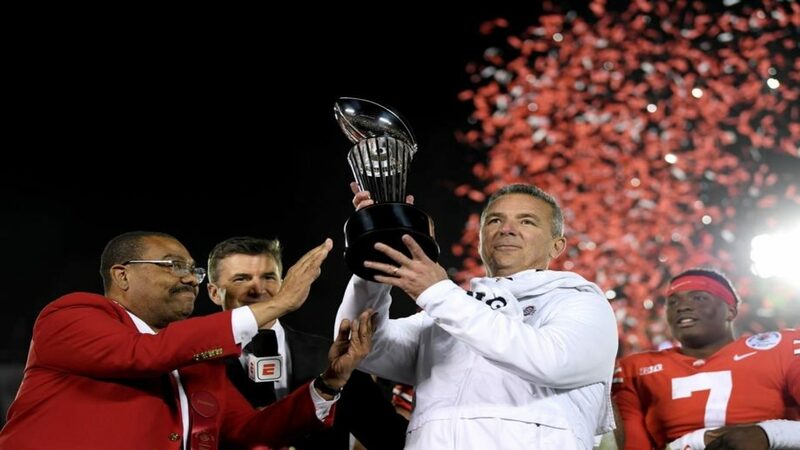 I was thinking back on the Urban Meyer era at Ohio State and how truly blessed we are to have had him coaching our Buckeyes. I started to think about the many trophies that have been added to the trophy room at the WHAC in just seven short years. Then I started wondering if Jim Harbaugh had delivered any trophies to the trophy case in Ann Arbor (he has) and if they even knew where the key was so they could display it with pride (you know... because they use it so infrequently). 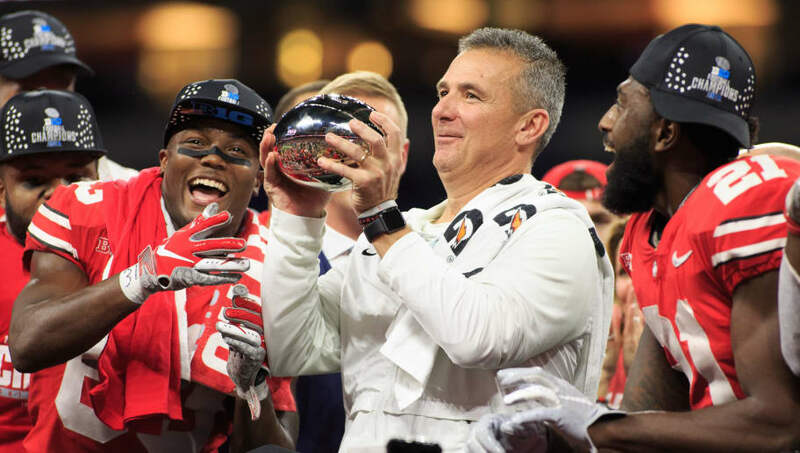 The Buckeyes were ineligible for post season play, but finished 12-0. No trophies this year. Finally eligible again for post season play, the Buckeyes once again went 12-0 during the regular season only to come up just short in the B1G championship game against the Spartans. The Buckeyes would also lose to Clemson in the Orange Bowl. No trophies this year. The Buckeyes go 11-1 in the regular season, winning their last 10 games after falling to Virginia Tech at home in week 2. Despite this amazing run, the Buckeyes found themselves on the outside looking in to make the inaugural College Football Playoff. 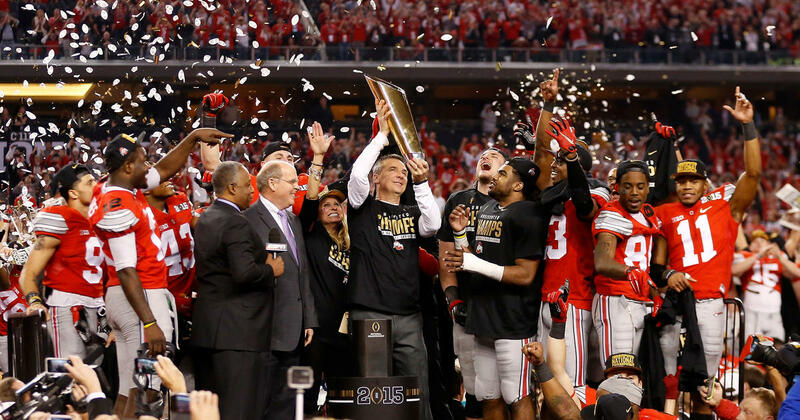 They needed to win the B1G Championship, and they needed to do it in style. 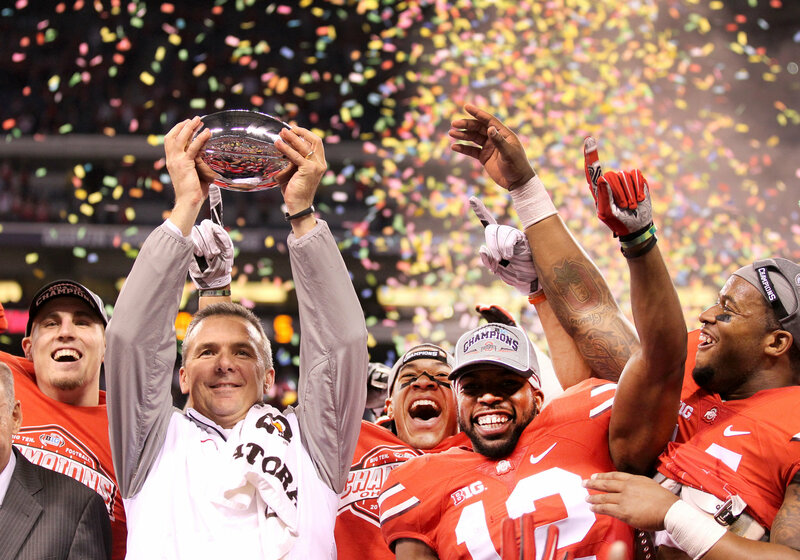 This was the first trophy ever won at Ohio State by an Urban Meyer coached team. Urban would later say that it was the first thing that any of these players had ever won at Ohio State (sorry, couldn't find the quote). This win was huge, and I'm not just referring to the score. Alabama. S-E-C. 85 yards. What a win. The greatest team ever assembled would once again come up short against the Spartans and miss a chance at B1G and national championships. Ohio State would go 11-1, missing the B1G Championship Game, but earning a date with Clemson in the College Football Playoffs. I'll stop here, no trophy this year. The Buckeyes found themselves back in the B1G Championship game against Wisconsin after a 10-2 regular season. The Buckeyes missed the playoff and faced USC in the Cotton Bowl. Following an 11-1 regular season, the Buckeyes returned to Indy to face Northwestern and win a second consecutive B1G title. Barely missing the playoff once again, the Buckeyes headed to Pasadena to send Coach Meyer out in style, at The Granddaddy Of Them All. I'll give credit where credit is due. Jim Harbaugh brought home the second trophy of his Michigan coaching career in 2018. B1G East Co-Champions... but to be fair, I'm also going to include the 7 division outright or co-champion trophies Urban brought to Columbus.